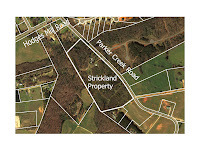 The request by Robert W. Strickland, 1571 Parker Creek Road, is one of three zoning issues on the agenda of the Planning Commission, which is scheduled to meet at 7 p.m. tomorrow night in the courthouse. The Commission also will review a request by RWJ Inc. to rezone just less than two acres of land now designated for Office Institutional Professional use so they can be incorporated into the existing Meridian subdivision off Mars Hill Road. A third request before the Planning Commission is for special use approval for a sign manufacturing facility inside the Lampkin Branch Business Park off U.S. 441 just north of Watkinsville. Athens Cellular Inc., doing business as Verizon Wireless, intends to obtain an access and utility easement running from Parker Creek Road to the proposed site of the tower, in the south of the 25-acre property. That property, according to county tax records, contains a single-family home built in 1971. The property at present is primarily wooded, according to Planning Department documents. What is called the tower compound will be secured by a gated, 6-foot-tall security fence, according to planning documents. The tower will be able to handle four wireless carriers, according to those documents. The tower itself will be located about 384 feet from the nearest property boundary and 393 feet from the right-of-way of Parker Creek Road. The land currently is zoned for agriculture, but free-standing towards are allowed in an agricultural zone with special use approval. The planning staff has recommended approval of the request. The Planning Commission will decide whether to recommend approval of the special use permit request to the Board of Commissioners.